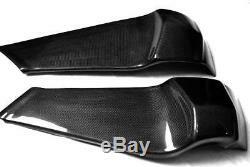 MDI Carbon Fiber Frame Covers for Buell XB9 XB12. All our carbon fiber Frame Covers are made with an Autoclave process, which uses the highest quality TORAYCA® PREPREG carbon fiber fabric from Japan. More information on the manufacturers specifications check our online store at MDIcarbonfiber. Cures at 400 degrees and a pressure of 5Kg/cm. One of the most advanced techniques for making composite components is by using PrePreg carbon fiber reinforcement, cured under heat and pressure to produce professional quality Frame Covers parts with a high quality surface finish, low resin content and excellent structural performance for your Buell XB9 XB12. UV protective coating and hand-polished to a perfect finish. Most of our products are direct bolt-on replacement of OEM Buell parts. Lighter and stronger than the original XB9 XB12 1125 plastic parts. The item "Carbon Fiber Buell Frame Covers XB9S/XB12S/XB9R/XB12R /XB9SX/XB12SX" is in sale since Tuesday, July 24, 2018.